“The Ghost In The Machine”: The Haunting Nature Of Unnatural Diegetic Sound. “M.R. James’ objects are imbued with our deepest fears, deepest terrors and resonances. The whistle can bring up a storm or bring a monster from the deep. The crown, that if you touch, its guardian will tear you to pieces.” – Clark (2012). Aside from creating some richly layered but sparsely atmospheric natural soundscapes, a number of the BBC Ghost Stories also have a logical opposite in their sound design. Alongside the aural presence of wind and the landscape came a stark use of manmade and unnatural sounds to create the aural shock of a haunting. This not only ties in to the original source material of the stories but also is now an apt indicator of the era in which the films were made; this was the golden age of the BBC’s Radiophonic Workshop where strange sounds and music would be created daily for any given need. These sounds can be seen as a mixture of new, technological innovation and the clichéd tropes of the supernatural in television; the classical ideas finding a natural home in the aural traditions and eccentricities of new media as a whole. Simply having the role of a sound designer on a program implants the idea of the unnatural upon the most basic of objects. If these objects are already unnatural in some way (perhaps being symbolic of a ghost or representing a ritualistic gateway to summoning a ghost) then this relationship will naturally be heightened to a new realm of aural haunting. This section is going to examine, but ultimately expand upon, this mixture. After all, the use of the sound in Clark’s films is hardly as strange or overtly electronic as the sounds for other fantastical dramas made at the same time[i]. Instead, this section aims to show how the stories’ stranger uses of sound came to denote both a Jamesian and a Dickensian haunting by using different thematic aural strategies to create unnerving sounds of the supernatural. The Haunted Nature Of Objects And Their Sounds. “The sound of the whistle had so fascinated him that he could not help trying it once more, this time more boldly. The note was little, if at all, louder than before, and repetition broke the illusion – no picture followed.” – James (p.132, 1931). “Although James is thought of as a writer of ghost stories, the malign figures he invokes are often better considered as demons rather than spectres. ‘Oh, Whistle, and I’ll Come To You, My Lad’ – like ‘A Warning To The Curious’, adapted for the BBC by Lawrence Gordon Clark in 1972 – describes an encounter with what writer and philosopher Reza Negarestani terms ‘Inorganic Demons’.” (p.1, 2012). Negarestani’s idea may be rooted in philosophy and applied to James’ work in the most basic narrative sense but it also provides a range of aural possibilities. Some aspects of this have already been discussed in previous sections; the hurdy-gurdy in Lost Hearts being an example that could equally fit into this section of the analysis as well as the more musical section that it currently occupies. Clark sums up this inherently Jamesian quality, it often being a favourite aspect of discussion when reminiscing: “A whistle blown could summon an enemy from the darkness or raise a mighty wind; a buried crown has a sacred guardian against invasion and to remove it earns the ultimate punishment.”(p.19, 2013). Other objects, however, have an aural aesthetic all of their own and allow further readings to be gained from the narratives in question. The whistle from Whistle and I’ll Come To You is the most obvious example of this but is also a fallacy in interpreting James’ story. The whistle is an ultimately distracting object that takes emphasis over the visual that the ghost eventually does manifest with. Fisher suggests that “The demonic entities in James’ stories were typically characterised as unquiet atavisms: relics from a pre-Christian past.” (p.4, 2012). Oliver would back this up when describing the history that inspired James’ use of the whistle: “James used legend and folklore very eclectically in his writing, and the ominous whistle of ‘Oh, Whistle, and I’ll Come To You, My Lad’ comes from Scandinavian tradition. It was believed that it was unlucky to whistle because one could ‘whistle up the wind’.” (p.8, 2012). In their subsequent adaptations, these objects would often be given a modern sheen of symbolism and even a Freudian element to them. Parkins’ dream sequence gives away what the truly haunted object is really to be; not the whistle of the story’s title but actually the bed-sheet. Whilst this may have some form of metaphorical meaning to it, repressed sexuality being a common theme read into James’ work, Miller uses the rustling nature and aesthetics of the bed-sheet to foreshadow and eventually create a haunting. “It was a sound, too, that seemed to have the power (which many scents possess) of forming pictures in the brain. He saw quite clearly for a moment a vision of a wide, dark expanse at night, with a fresh wind blowing, and in the midst a lonely figure – how employed, he could not tell.” (p.132, 1931). For Miller, it is the bed-sheet and its sounds that are most ominous. Parkins wakes from a half-sleep to the sound of the rustling sheets of the other bed. The visual that accompanies this is a very dark shot of some ambiguous movement of the said sheets, so it is the aural element of the haunting that is doing the work, both in scaring Parkins out of bed and creating fear for the viewer. The realisation that this is the culmination of all of the bed-sheet imagery and emphasis throughout the narrative drives Parkins over the edge; his voice becoming disembodied as he emits a primal gurgle of fear as analysed earlier. 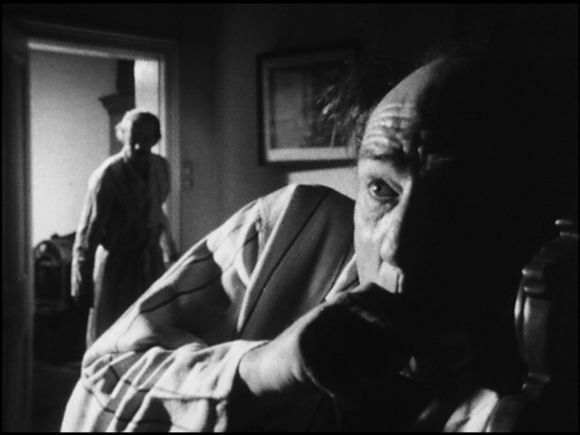 Whilst the whistle that he found did indeed spark off this haunting, the way in which it manifests, or is shown to manifest aurally in the film, is strictly removed from that object and instead placed subtly onto the innocent and innocuous bed-sheet. Clark’s films have a similar method to giving objects an aural accompaniment though he does this for very different reasons. Many of the objects within the stories adapted by Clark are very “unsounding” or at least have a relatively small potential to be recognised merely by the sound they can make. 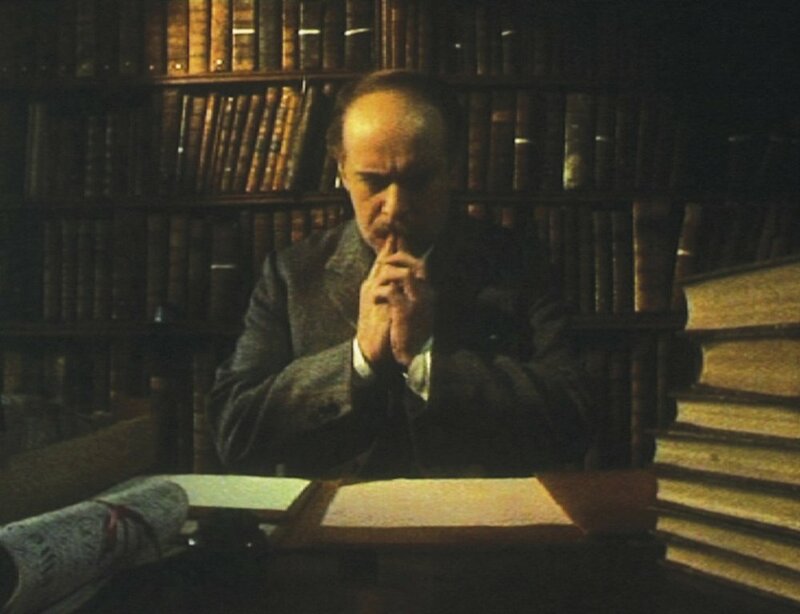 The wooden rail in The Stalls of Barchester and the tree from which it came has very little potential in creating an aural equivalent, so Clark moves the emphasis of the important “inorganic demon” to a different object. In this story, the emphasis is on a mysterious cat that plagues our main character once he has touched the wood “with a bloodied hand.” (1931). The sound of a cat meowing, hissing, and generally knocking things over becomes the real sound of the haunting for the archdeacon, who questions his man-servant: “Do we have a cat? A big brute?” (1971). “The soundtrack is remarkable. As well as the disquieting religious chants that open and close the story, sound effects constantly unsettle the viewer, from the frenzied Latin whispers that race through Dattering’s head at the séance, to the choking groans of the barely-seen abomination which guards the treasure.” (p.8, 2012). This is more than just a collection of bodiless voices. It is a multitude of sounds brought about by and associated with the “inorganic demon”. Somerton begins to dig out the part of the wall where the Abbot’s gold lies and successfully removes it but, along with this treasure, comes the persistent and surreal presence of slime that comes forth in the strangest of ghostly attacks. The slime is audibly grotesque; a mysterious, deathly hand wiping it with a squelching sound upon the Reverend’s face before he flees in terror with the treasure in tow. The sound of the slime is the ghost’s key feature, being heard on its next apparition before it is seen. This is highly appropriate as, in the original story, Somerton only knows that the creature has left when the sound stops: “But with the first glimmer of dawn it faded out, and the sounds ceased too; and that convinced me that the thing or things were creatures of darkness, and could not stand the daylight…” (p.178, 1931). Whilst locked in his room, the slime “gloops” under the gap in the door, taking far more precedence over the aesthetics of a simple bag of gold which barely even jingles with the sound of coinage. Somerton utters a most telling phrase on James’ use of sound when relating this slime to his pupil and the haunting it represents (in spite of the line being an addition to the modern script by John Bowen). Somerton simply states: “I have sat up all night listening… It makes a curious sound…” (1973). It makes for an apt but unnerving conclusion to the analysis of James’ work and adaptations. [i] Doctor Who, Sapphire and Steel and Children of the Stones being three of many examples.